Diagon Alley offers multiple locations for using your interactive wands. One of the easiest spells to cast is the Locomotor Bellows spell at Bowman E. Wright Blacksmith. 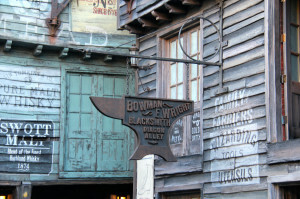 Bowman E. Wright Blacksmith was a metalsmith shop that made objects from wrought iron or steel. It was located by the intersection of Diagon Alley and Carkitt Market, by the Mermaid Fountain and The Hopping Pot. You can find the spell casting location, just outside Bowman E. Wright Blacksmith, along with the Reparo spell in the same location.